We have opened Cafe Bistro - a place where you can sit down by the window and in nice environment, be able to drink coffee and eat tasty, sweet or salty snacks. We have celebrated the 10th anniversary of Salon Eleganza "The World of Good Clothes". Special guest - The Eleganza Brand Ambassador Izabela Trojanowska. Eleganza clothing store has gained a new arrangement - thanks to reconstruction, more space and convenience has been gained. We have celebrated the 35th anniversary of our Company. Many things have changed since the time of the first opening of our neighborhood shopping center. Invariably the most important rules for us are: quality and fresh products, professional service and good relations with our Customers. 15th edition of our Social Mission - a concert at the Bemowo Cultural Center, where grants were given to talented children from the Bemowo district. So far, about 350 young artists have been benefited from start of the Mission. We have celebrated our 10th birthday of Blue Stop. Promotional campaigns, contests, mega discounts - these were the benefits for our customers and for us - satisfaction that we constantly increase our potential and we can celebrate more anniversaries. Arrangement of our chemist and perfumery "Drogeria Blue" has been changed. New logo, new name – Blue Stop - and new advertising slogan "Worth stopping", which perfectly reflects the idea of ​​this place. You can quickly buy everything needed for your beauty. Our organizational form has been changed from Cooperative to a Limited Company. 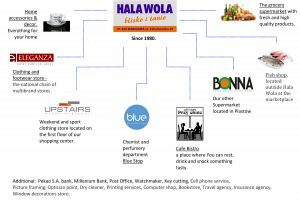 Since then, we are under the name Hala Wola sp.z o.o. The same year was held 10th edition of our Social Mission. Since first edition we were able to help over 150 young artists from Bemowo district . Supermarket BONNA - Your Shopping Near Home was opened in Piastów. It is located at the Warszawska and Bohaterów Wolności streets crossroad. Bonna is our first supermarket outside our main location. New arrangement of the "Upstairs" under the slogan "look young". – which means new offer of comfortable, weekend clothing addressed not only to teenagers, but to all, who wants to look young and feel free. Upstairs has also gained a new logo. Eleganza multibrand has been founded. It was created by agreement of the many polish department stores. Since then our clothing and footwear departments have gained prestigious name "Eleganza Salon"
The first edition of Hala Wola Social Mission under the slogan "Hala Wola for the youngest". It is a special action in which we support talented children and youngsters from the Warsaw district - Bemowo. Our mission could not exist without our Clients, who exchange their points collected in “Zakupy do Woli” program into real money, which we use to buy grants for kids. One point equals one PLN. We have started the loyality program "Zakupy do Woli". Shopping has become more pleasant. Everyone can collect points and change them into rewards from our catalogue. Chemist and perfumery department joined to the chain store "Drogerie Blue". It has gained logo, signboard and changed arrangement. Since then, a Drogeria Blue magazine has been coming out. Shopping department names Upstairs was opened on the first floor of Hala Wola.It offered clothes mainly for teenagers. Logo and name are related to stairs leading to the first floor. A very important year in the history of "Hala Wola"- as a result of liquidation of WSS "Społem" was founded Handlowa Spółdzielnia Pracy Hala Targowa "WOLA". We gained independence, that initiated building and interiors modernization, and increase of commercial offer. Opening of the “Hala Wola” that belonged to WSS "Społem". In that time “Hala Wola” was the biggest and best stocked shopping center in Warsaw. The main designer of “Hala Wola” was eng. architect Mieczyslaw Sabat, from the Office of Studies and Projects Internal Trade and Services. General constructor was Construction and Repair Company of Trade and Services "Budrem". The interior design has been arranged by artist Zygmunt Pomeranian.